Soluble lead species in soil are subject to various reactions with the soil matrix that ultimately limit environmental transport. Many aqueous inorganic lead species exist in soil solution due to hydrolysis reactions, but are all cationic; freely dissolved lead is a divalent [+2] metal cation. Dissolved cations in most soils are subject to pH-dependent electrostatic attraction to negatively charged soil surfaces, such as with the functional groups of humic acids in soil organic matter (SOM) and onto the surface (and within the lattice) of a variety of secondary aluminosilicate clay minerals. These electrostatic reactions are generally considered relatively weak and exchangeable, whereas covalent (sometimes considered “irreversible”) reactions, in the case of lead, can occur with (1) the surfaces of amorphous iron and manganese (and to a lesser extent aluminum) oxides within a specific pH range (dependent on the specific metal oxide sorbent) and (2) by formation of very specific, inner-sphere complexes with SOM. 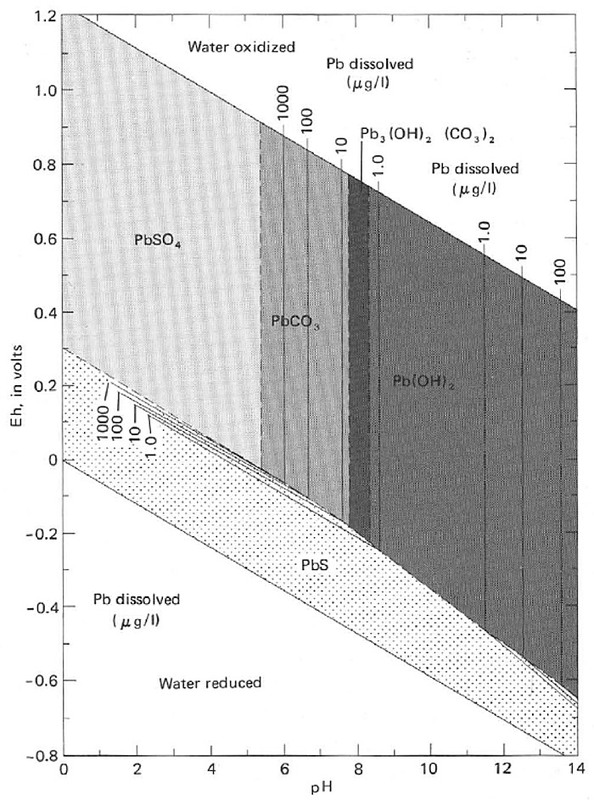 Depending on the concentration of dissolved lead species in soil solution as well as the redox potential and composition of dissolved ligands, lead can form sparingly soluble precipitates with phosphates, sulfides, and other anions; see Figure 6-2 for Eh/pH diagram for a theoretical Pb+CO2+S+H2O system. Furthermore, the solubility of lead in soil (the fraction that remains dissolved in soil solution) decreases over time because of the relatively slower kinetics of the irreversible adsorption and precipitation reactions. Other attenuation mechanisms related to long-term soil forming processes also reduce lead solubility in soil (Hamon, McLaughlin, and Lombi 2006). While lead can be redistributed within the soil profile over geologic timescales (Sterckeman et al. 2004), examples of long-range transport or migration to groundwater following anthropogenic lead contamination of soils (as opposed to surface water) are scant; see Clausen, Bostick, and Korte (2011) for a comprehensive review. For a more thorough overview of lead chemistry in soil, see Basta, Ryan, and Chaney (2005). In general, lead is considered relatively insoluble and immobile in soils, particularly in soils with net negative surface charge such as those in the conterminous United States.